Easy Thumbnails 3.0 free download. Easy Thumbnails is a program for creating accurate thumbnail images and scaled-down/up copies from many picture formats. 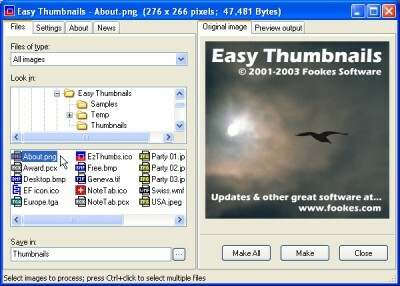 Easy Thumbnails is a program for creating accurate thumbnail images and scaled-down/up copies from many picture formats. The interface makes it easy to find your images, select them for processing individually, in groups, or in whole folders, by using a simple file selector and built-in image viewer. The slider controls help you rotate images, adjust the contrast, brightness, sharpness and quality; the built-in viewer will help check out the results. For image-processing enthusiasts the software gives a choice of nine resampling algorithms for the best possible results. Easy Thumbnails allows you to convert small batches of images in Windows Explorer from the File menu or with a right-click of the mouse, display thumbnails in your browser, and even to take advantage of command-line switches to generate thumbnails seamlessly from other programs. You also have the possibility to save your thumbnails to a Web page using a HTML template that you can be easily customized to create your own layouts, and there's helpful documentation that includes full instructions and some useful tips. NoteTab Light is the ultimate free Notepad replacement and a capable HTML editor. Web Resizer was made to convert and downscale common graphic format such as JPEG, PNG, WMF, TGA and so on.